The situation at the South African Broadcasting Corporation (SABC) has landed communications minister Faith Muthambi in hot water as opposition parties have called for her to be sacked. The embattled public broadcaster faces a mountain of challenges, such as the illegal appointment of its former COO Hlaudi Motsoeneng, the board's fitness to carry out its mandate, and the misappropriation of funds ? the corporation reportedly suffered a loss of R411 million during the last financial year. Business Day reports the National Assembly adopted a report presented by Parliament's ad hoc committee that probed the issues at the public broadcaster, which suggested president Jacob Zuma should reconsider the minister's desirability in Cabinet. The newspaper notes members of the ad hoc committee suggested Muthambi might have violated the Constitution by, among other things, acting in a way that "improperly" benefited Motsoeneng. 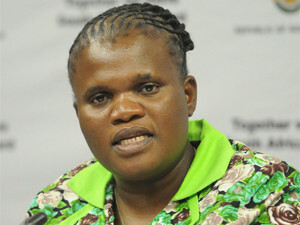 The SABC is not the only entity in her portfolio for which Muthambi has come under fire. Since coming into office in 20l4, she has faced a lot of criticism for wanting journalists to report so-called "sunshine journalism", the way she has managed government's digital migration process and the production of set-top boxes. The minister has also been in the dog-box with members of her own party, the African National Congress (ANC). The party's Jackson Mthembu and Blade Nzimande have come out against Muthambi, saying she defied the ANC and alliance decisions with regards to the amendments made to the Broadcasting Digital Migration policy. Last year, Marian Shinn, Democratic Alliance shadow telecommunications and postal services minister, said Muthambi was the major stumbling block in the digital migration process. "She [Muthambi] must be removed from office if any progress - free from legally expensive decisions to promote dubious agendas - is to be made." Meanwhile, minister of state security David Mahlobo said this week government is contemplating regulating social media in the wake of the fake news phenomena. Muthambi then came under fire for meeting Russian deputy minister of telecoms and mass media Alexey Volin to discuss "best practices" for the media, in Pretoria on Monday. According to City Press, the minister said the platform between the two countries' departments of communications should be used to share "best practices in the area of communications and media". In Russia, journalists who do not toe the Putin-line are prosecuted, noted City Press.